A Blueberry Ginger Smash Cocktail contains freshly muddled blueberries, rum, ginger liqueur, and a whole lot of ice. Like summer, it’s easy and simple, created for nights relaxing on the patio and beach. With the start of school, those nights may be long gone, but luckily this drink is just as delicious in a dorm room. Enjoy it now, before summer fades any further away. Hillary Pollak is a senior at New York University, where she studies sustainable food. She loves bitter drinks, summer fruit, and homemade ice cream. 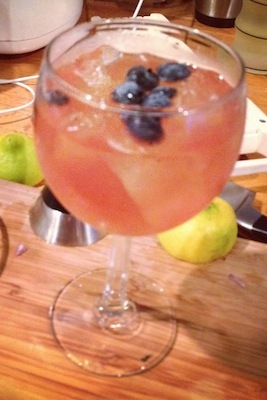 In a tall glass, muddle the blueberries with the lemon juice and honey until the skin breaks and they turn pulpy. Fill the glass with ice, then pour in the rum and ginger liqueur. Stir. Top with soda water and a few blueberries for garnish.